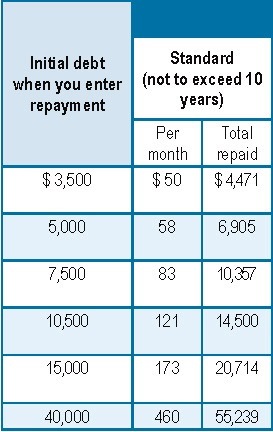 A standard repayment plan is what you get if you do not make a different choice. You have a minimum of five years, but not more than ten years to repay with this plan. FFEL borrowers are automatically assigned this plan if they do not select a different option within 45 days of being notified by the lender to choose a repayment plan. Standard plans have the highest monthly payments, but allow you to pay off your loan in the least amount of time. The monthly amount may vary if there is a variable interest rate. The Department of Education’s repayment estimator can help you get a sense of repayment amounts under the different repayment plans.